We are Canada’s biggest history magazine. We tell exciting stories from Canada’s military past and present. From Vimy Ridge to D-Day, through the Korean War, the Cold War and into the deserts of Afghanistan we have been there. Canada’s most influential historians bring you through the mud, dogfights and roadside bombs to a greater understanding of the events that have shaped Canadian history. 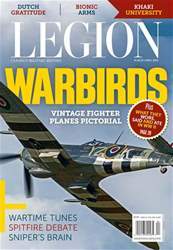 Legion Magazine has been the authority on military history for almost a century. Rare archival and modern war photography presents the gritty and un-glorified face of warfare. Legion Magazine publishes six issues a year as well as special volumes with dozens of powerful archival photographs. Join the nearly one million Canadians who read our stories, and let us tell you how we began and where we are going. Is the Spitfire the most elegant aircraft ever built? You'll receive 6 issues during a 1 year Legion magazine subscription. Royal Canadian Legion Mag - First Class military history and current military affairs mag for the Royal Canadian Legion community. Five Stars, would give it TEN if I could. You'll receive 6 issues during a 1 year Legion magazine print subscription.